This week in my latest PopMatters article, I equate the wonderful game of Android: Netrunner with political cartoons. I know, it sounds strange, but hear me out. This game is steeped in political themes about corporations locking down their nefarious agendas from rebellious hackers. It's the stuff of science fiction, but it's also oh so real. As such, the CCG (or LCG) model provides numerous opportunities for timely little critiques and commentary on the political landscape of our time. This was a hard piece to write, because I did not want to come off as overly gratifying of the political thought put into Netrunner. It is, first and foremost, a somewhat jovial experience. This is not Papers, Please by any means. Fantasy Flight wants to support a game with a strong theme, not alienate its own users. Still, I also didn't want to underplay the importance of small opportunities for political commentary. Few games try to incorporate topical subjects at all, and few bother to do so with any tact or bravery. Every data pack released by Fantasy Flight has one tongue-in-cheek derision of the modern techno-political landscape in one way or another. These little manifestations of political commentary add up. Through play, we carry our an exercise in roleplaying and engage with an ongoing political discussion, even unawares. I would love to see more of this small-scale commentary included in more games, particularly those with regular updates and releases. Most recently, I have moved past my hatred of so-called "Fast Advance" decks in general and embraced an attempt at making the strategy work for Weyland. It's clearly not as successful as an NBN attempt, but the nigh-endless source of money Weyland can accrue, coupled with the constant threat of Scorched Earth, makes it far more thrilling than the current meta trends. I can't get enough of it. 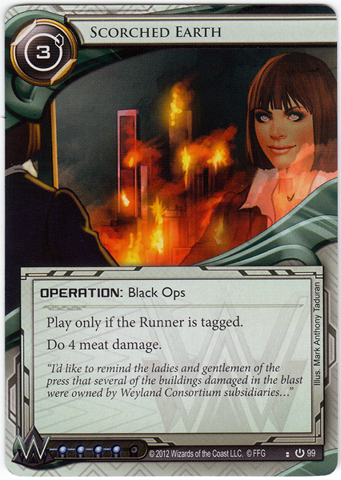 Also, embracing Weyland's tendency towards bad publicity does so tickle my affection for political gaming experiences.